I recently got the chance to try the L'Oreal Fibralogy hair care line through Influenster and have been testing it over the past month or so. As someone with fine, flat hair, I've been consistently let down by products promising full, voluminous hair, yet predictably I'm always optimistic that the next potion will definitely be the one. However, having previously tried L'Oreal Volume Filler Shampoo (similar with Filloxane technology) with no results, I was very skeptical about Fibralogy. 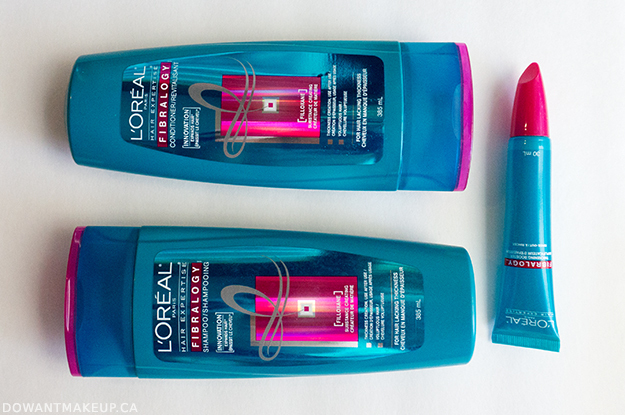 I received the shampoo, conditioner, and thickening booster and used all three together in my routine. The line also includes a hair mask, although I didn't get to try that. The special ingredient in Fibralogy is Filloxane, an ingredient that claims to "deeply penetrate the hair fibre and expand from within" with a "cumulative thickening effect". The Beauty Brains explains that this is similar technology to the gel that helps seal cracks in glass. Long story short, I actually think this stuff works, guys. Visually it's hard to say if my hair looks fuller but it does feel thicker when I run my hands through my hair or gather my hair up in a ponytail. If you know me, you know I am generally cynical about the promises of super special ingredients plastered all over the packaging (I call them "headliner ingredients") but L'Oreal may have something here with the Filloxane. Time for another empties post! My little David's Tea bag was starting to overflow again, and I recently did a big overhaul of my entire makeup stash, which revealed a bunch of old product I should have parted with a long time ago. The Body Shop Facial Blotting Tissues in Rose Pink - I think these are discontinued now but this product was my first foray into blotting papers - I started buying TBS tissues in grade 11! 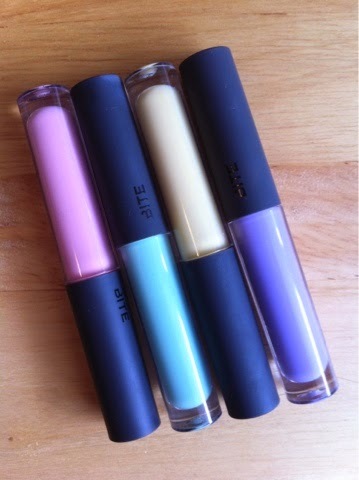 They worked pretty well but they were dusted with blotting powder which isn't always ideal for my dry skin. I prefer Sephora blotting papers now. 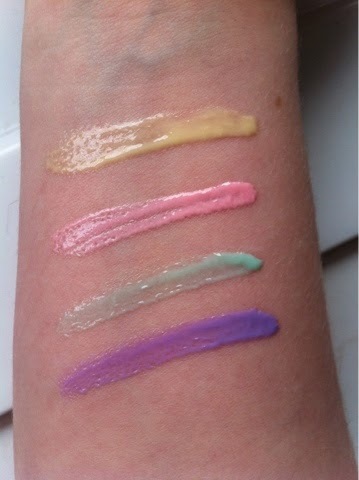 Marcelle BB Cream in Light/Medium - my first Marcelle BB Cream, purchased years ago when Marcelle first came out with this and beauty bloggers were all abuzz about it. I really did use it all up! It was my staple for a while and I repurchased a replacement, but now that I've amassed a collection of base products I use it less and less. I still like it and would recommend it as a drugtore BB option though. CeraVe Hydrating Cleanser - I purchased this in the Great Eczema Breakout of 2013 because my skin was really sensitive and raw, but I still needed something to gently cleanse. 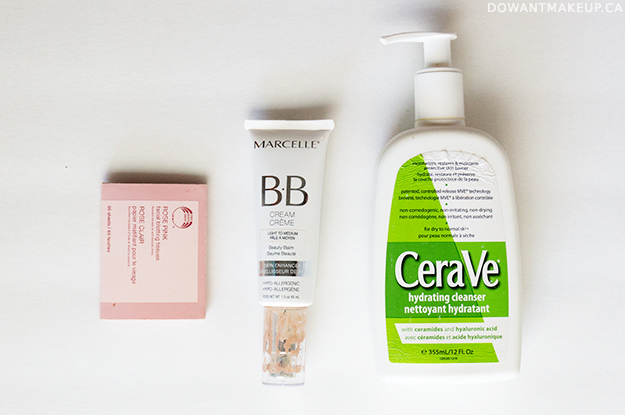 This fit the bill perfectly and didn't irritate my skin further. This is a good option for morning cleansing for dry/normal/sensitive skin; since it's so gentle, don't expect it to remove any makeup. 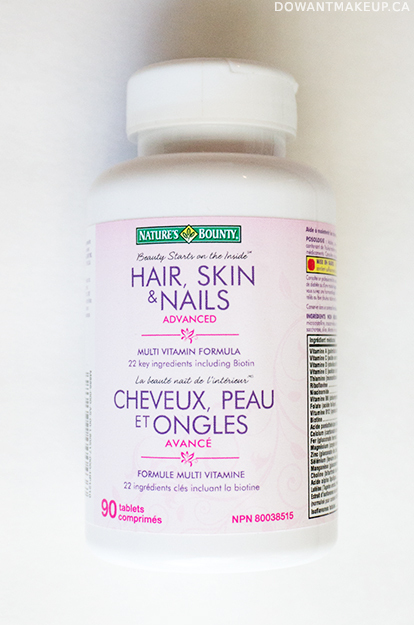 Nature's Bounty Hair, Skin & Nails Advanced - I picked up this multivitamin totally on a whim, on sale at Shoppers. I wasn't really expecting anything at all but after maybe two weeks, I suddenly realized that I was shedding way less hair than before. I shed hair like a cat and lose a lot of hair in the shower. It's kind of gross but the hair-catcher thing in my shower drain used to catch so much lost hair that the water couldn't quite drain fast enough. Lately I had been having a lot of anxiety about how much hair I've been losing - how could my hair possibly regrow to replace the hair I was losing all the time? Now I don't find much hair in catcher and I'm so relieved. I compared it to a Centrum bottle in the closet and found that the amounts of vitamins and minerals between the two are pretty close (please note I am not a doctor!) with more biotin and folate in the Nature's Bounty. Both of these are associated anecdotally with hair and nail health. Since finishing this bottle, I've switched to the biotin gummies instead, because gummies. Hi everyone, a quick post today as I settle back into the habit of blogging again after disappearing for the past 2 weeks or so. 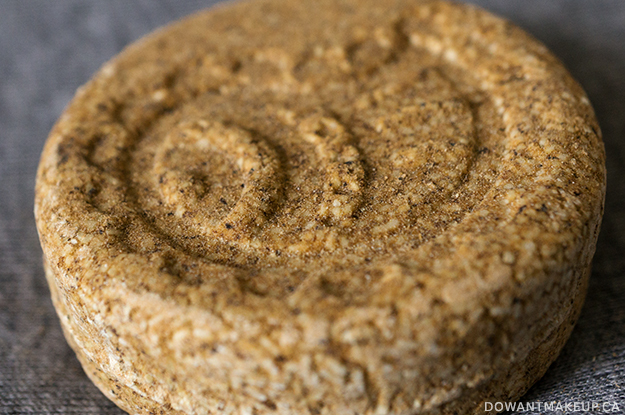 LUSH Copperhead is one of six new solid shampoo bars launched this spring. LUSH already offers henna hair dye bars to add shine and colour to hair, but now they've worked red henna into a shampoo bar promising similar effects. 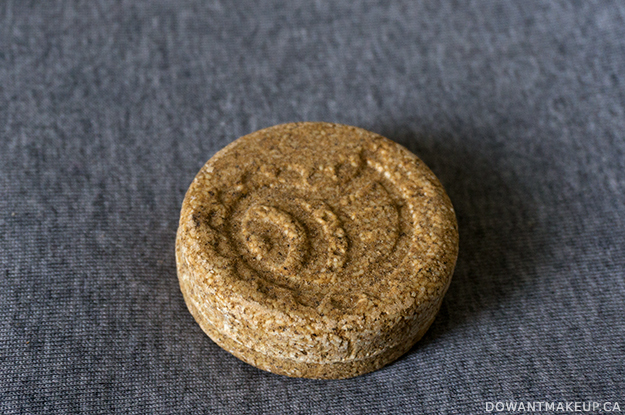 If you're not familiar with the shampoo bars, FYI this is a puck that lathers up quickly and easily in the shower to wash your hair. You can either rub the bar in long strokes down the length of your hair, or draw 1-2 circles on the crown of your head with it, like I do. When not in use, keep it safe and dry in a tin or a zip-top plastic bag. They tend to leave hair feeling super squeaky clean, so they're great if your hair needs a really deep cleaning. They last much, much longer than their smallish size may suggest. What I really love about LUSH's shampoo bars is that they are low in packaging (no plastic, wrapped in paper if you buy in store) and are super portable (no liquid to spill all over inside your luggage!) However, after previously trying Seanik and Soak & Float, and now Copperhead, I feel that the shampoo bars just aren't for me. Although I didn't notice my hair colour fading any faster than usual, my scalp and hair were looking more dry, which is in line with my previous experiences with their shampoo bars. (Whenever I use a LUSH shampoo bar, I tend to pair it with a heavier, more moisturizing conditioner to try to offset drying effect.) I might have been able to put up with the dryness if it really did give my hair a boost in shine and colour, but I didn't really notice any difference, so Copperhead is a miss for me. The description calls the scent of this bar "intoxicating" with fairtrade vanilla and roasted cocoa extract. I think some people might love the spicy, earthy scent but I wasn't a fan of this myself. I would say the scents of the coriander seed oil and powdered rosemary come through more than anything else. If you have had success in the past with other LUSH shampoo bars, Copperhead might be worth a look! Unfortunately, it didn't do anything for my fine, thin hair and exacerbated my dry scalp. 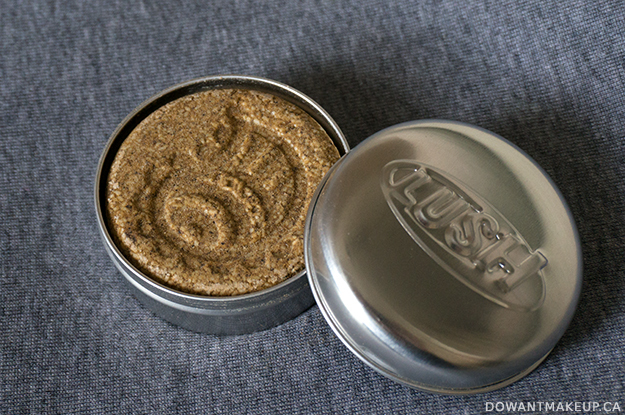 Judging by the reviews on the LUSH website and online, it's actually pretty well-loved, so I'm in the minority. I might revisit Copperhead once every week or two in between shampooing with something that agrees with my scalp a little better, and hopefully see some of that promised shine and colour.